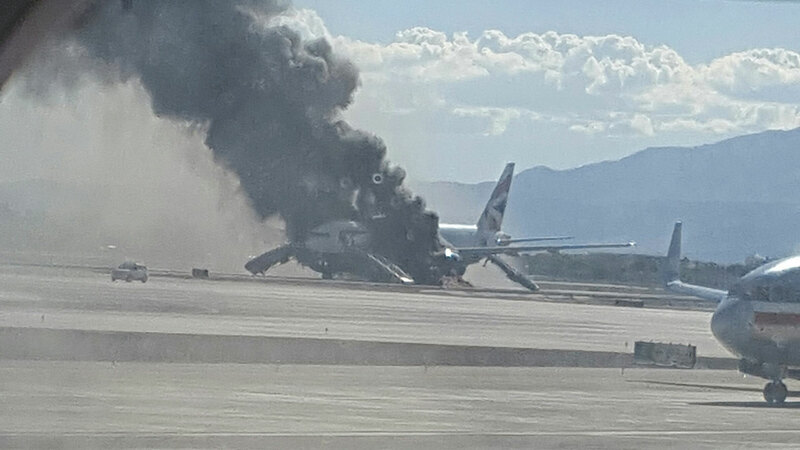 LAS VEGAS -- Passengers on the British Airways jet whose engine caught fire just before takeoff in Las Vegas escaped with their lives - and some with their carry-ons, as well. While flight crews tell people to leave belongings behind in an evacuation, pilots say they seem increasingly inclined to grab whatever they brought on board. And sometimes even a selfie or two. "We're always shaking our head," said Chris Manno, a veteran pilot with a major US airline who took to social media Wednesday to slam those pictured on the Vegas tarmac with bulky cabin bags. "It doesn't matter what you say, people are going to do what they do." The engine on the London-bound Boeing 777-200 caught fire Tuesday as the plane was gathering speed. Though the evacuation was swift, officials said Wednesday that 27 of the 170 passengers or crew on board required hospital treatment for cuts, bruises or other minor injuries, mostly from the evacuation slides. "A deadly slalom" is how pilot Patrick Smith described baggage on an emergency slide in a blog post. Bags also could tear the inflatable slides, block exits on board and cause other injuries in the chaos of an evacuation. Manno noted that passengers also evacuated with belongings when a Delta Air Lines jet nearly skidded off the runway at New York's LaGuardia Airport in March and an Asiana Airlines jet caught fire after a hard landing in San Francisco in 2013. "We're seeing this more and more," said John Goglia, an aviation safety expert and former member of the National Transportation Safety Board. Goglia believes that because air safety advances have made accidents far more survivable and injuries often less severe, more people can - and do - bring bags as they evacuate. Passenger Karen Bravo, 60, of Las Vegas, said she happened to have her purse and some other passengers further back in coach had time to grab their carry-on luggage while waiting to evacuate. "It would be like if your whole house was on fire and you had to go out the door," she said. Guidance posted online by the Federal Aviation Administration advises passengers to leave bags on board during an evacuation - but does not mandate it. Airline crews may make that announcement during preflight safety demonstrations, and during an emergency, would typically tell people to leave bags behind. Passengers are required by law to follow all crew instructions, FAA spokesman Ian Gregor said. "Flight attendants are the first line of defense in emergencies," he said, declining to address whether the agency believed emergency-evacuations-with-bags were an increasing problem that merited any regulatory action or public education campaign. The Association of Flight Attendants, which does not represent the British Airways crew, said workers would have encouraged passengers to leave without their belongings for efficiency. The union said it has called for updated evacuation standards to match the latest cabin conditions, as more people fly with carry-on luggage and personal electronics.